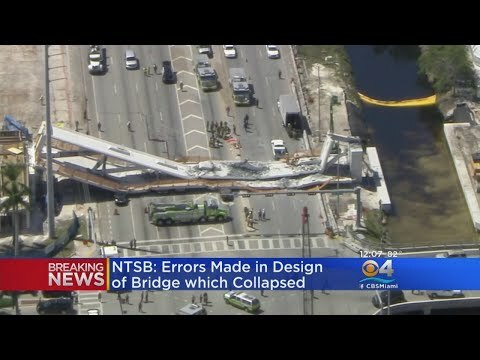 Miami bridge collapse: NTSB Report Cites “Design Errors”. Errors in the design of the FIU pedestrian bridge that collapsed in March killing six people, is likely the cause of the tragic incident, according to the National Transportation Safety Board. Six people died and eight others were injured when the bridge collapsed March 15, 2018. Eight vehicles were crushed in the collapse, seven of the vehicles were occupied. The design review was conducted by the Federal Highway Administration’s Office of Bridges and Structures in support of the NTSB’s ongoing investigation. The Federal Highway Administration is a party to the NTSB’s investigation. Investigators also tested concrete and steel samples taken from the bridge following the collapse and found those materials did meet the plan’s specified minimum requirements.